Leverage: "The Beantown Bailout Job"
It’s hard to do light and frothy TV well. In the past year or so, both Chuck and Burn Notice have managed to figure out the formula for fun action hours, trying out things that did and didn’t work in about equal measure in their first seasons and then tweaking just a few things in each series’ underlying formula to improve substantially in their second seasons. TNT’s “Hey kids, let’s clear out the barn and put on a heist!” good-time hour, Leverage, started out at a lower level than either of those shows (for one thing, having the crew make such a killing in the premiere dramatically undercut the stakes for the rest of the series – now the crew doesn’t have to wrestle with the difference between altruism and staying alive), but toward the end of its first season, it really started to click. Now, TNT’s moved it to the summer. On the one hand, its goofy tone will probably fit better there than it did in the winter. On the other hand, that left the show’s creative personnel with less time to figure out what worked and didn’t work about the show than Burn Notice and Chuck had (though, granted, in both cases the writers strike provided a longer than average break between seasons). The biggest problem with Leverage is that the cast is so generally good and has such a nice rhythm that the show is too tempted to lean on them to get away with stuff. 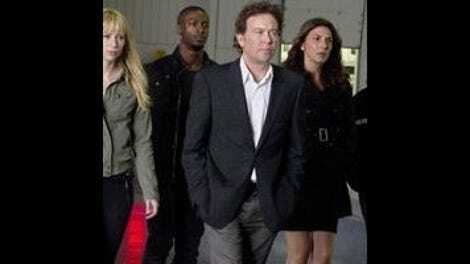 With Timothy Hutton at the head of a gang of thieves and actors like Beth Riesgraf (who never met an oddball line reading she didn’t like) and Christian Kane (who does tough guy better than just about anyone) on the team, this is a solid cast of likable players, who have coalesced into an ensemble with genuine chemistry. It doesn’t hurt that the show’s central premise is so solid and of-the-moment that one can overlook its TV-iness. Yeah, the idea of having a bunch of thieves who steal from the rich to give to the poor feels like something that came up in a misbegotten focus group, but, dammit, everyone wants to steal from the rich and give to the poor right now. Mostly because we’re all poor. But whatever. So Leverage is a show with a lot of potential, especially as a fun summer time-waster. It definitely helps that it’s one of those shows where you can learn something new in every episode (and not of the dry, PBS facts variety – the season premiere taught us all how easy it is for computer hackers to track our movements using security cameras!). It also helps that the heists are pretty solidly conceived of and plotted. None of this is rocket science, but seeing the team fall into their established roles and then seeing how circumstances force them to subvert those roles is a recipe for fun, undemanding TV. More problematically, Leverage never quite lives up to that potential. As if coasting on the likability of the cast, creators John Rogers and Chris Downey and their writers are often too quick to lean on “breezy” as a default tone for the show. Yeah, it’s fun, but the best fun shows (like Burn Notice and Chuck) also have emotional and dramatic stakes, and Leverage too often suffers from not having that. The episodes where it has (like in the first season’s two-part finale, which strained the team to the breaking point and brought in Kari Matchett as Hutton’s character’s ex-wife), the series feels like something that could really grow on you. But most weeks, the show is content to let its cast, premise and solid plotting do the heavy lifting. It’s not like this is a bad thing – few shows have even one of those three things – but it does leave the viewer a bit frustrated as to what could be, what might be. That said, though, if the series was ever going to live up to its potential, it would take a break between seasons for the writers to figure out what about it needed tweaking and what should stay the same. So, that in mind, did Leverage make the leap between seasons one and two? For now, it’s going to have to be a qualified “not quite.” The second season premiere, “The Beantown Bailout Job,” is a fairly classic getting-the-band-back-together episode, since the first season finale scattered the team to the winds. To the show’s credit, it wastes no time in reuniting the team. They meet again at the debut of Sophie (Gina Bellman, the one actor in the cast I’m not quite sold on) in a local production of The Sound of Music and are then quickly drawn into the intrigue of why, exactly, a man Nate (Hutton) pulled from a burning car wreck was marked for death and why Nate got drawn into it as well, an assailant coming to his apartment to kill him as well. In the premiere, Leverage feels improved, but it’s not quite all the way there yet. The main thing that feels improved about the show is the fact that the real world has dumped a ton of compelling material into the show’s lap. The premiere could pretty much be a fictionalized version of one of those This American Life episodes about how the economy got this way, succinctly summarizing the current economic crisis and tossing in a joint plot between the mob and a bank to legally defraud the government. It’s surprisingly fun, given how depressing the backstory is, and the real world component gives it that extra kick. The show also moved production to Portland, Ore., in between seasons, and the city’s grey, leafy exteriors are a pretty good match for the series’ tone. Portland, like Seattle or Vancouver, can have the misfortune of not really looking like anywhere specific, but that generic Pacific Northwestern look somehow suits Leverage just fine. And, of course, everything that worked about the show in the past still works here, from the cast to the premise to the plotting. It also doesn’t hurt that the writers aren’t scared of playing up the personal connections between the characters in a way that they were in the more procedural first season. But there’s something still missing, and it’s hard to put your finger on just what it is. Nate and crew are so well off that they’re pretty much just robbing people out of the pure goodness of their hearts and the joy of doing the job. When they’re in the midst of the job, this usually allows the show to slide by easily (like in that scene where Nate, Eliot and Sophie figure a way out of that seemingly deadly situation in the warehouse), but it’s not something one spends a lot of time pondering once it’s over. I think the problem here is that the show has followed that Robin Hood motif up to a point. It’s got the heroes and the way they work together down perfectly, but it hasn’t quite figured out a way to put their backs to the wall. Robin Hood works as a character because you always know that when he pulls his robberies, he’s on the verge of being caught, of having his life ended. Leverage, content to be lighthearted, never seems to put its characters in that kind of jeopardy (though, OK, I was pretty shocked when it seemed like the show had killed Eliot at the end of act three). In short, this is a series in dire need of a Sheriff of Nottingham. But as a light summer diversion? This will do quite nicely. It’s not perfect by any means, but I tend to think it’s a little underrated. There’s a good show lurking somewhere within Leverage, and I’m going to keep up with it in its second season to see if that good show comes to light. I seem to be the only person in the world who likes Riesgraf on this show. I guess I just enjoy actors who are constantly putting different spins on the line than you’d expect them to. Having the team move into Nate’s apartment as their primary center of operations and mess it up in new and different ways seems like a positive development and a good source for character comedy. So does anybody else here watch this show? Anyone going to keep with it and hope for the best?